METHUEN, Mass. (Aug. 16, 2018) – Boston North Shore seniors will soon have the opportunity to experience best-in-class, all-inclusive, resort-style retirement living when The Woods at Merrimack opens in Methuen in fall 2019. Managed by Sunshine Retirement Living, a family-owned business based in Bend, Oregon, with 20 senior living communities in the United States, The Woods at Merrimack will feature 140 thoughtfully designed apartments on beautifully landscaped grounds with an array of world-class amenities to appeal to today’s more modern and active senior. The community is located at 197-199 Howe Street directly across from the Merrimack Valley Golf Club. 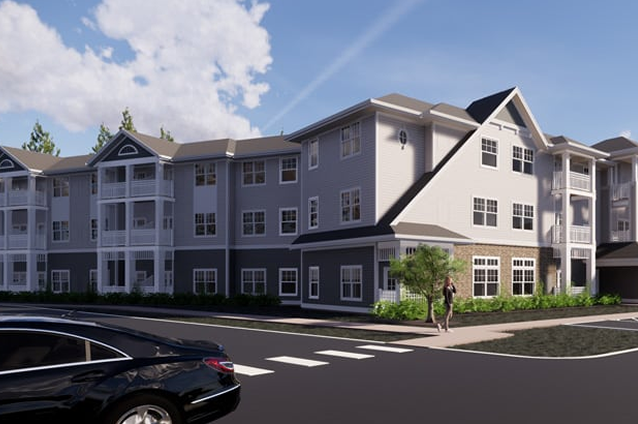 With the official groundbreaking scheduled for September 12, 2018, The Woods at Merrimack will follow a Person-Centered Care philosophy, with numerous services, comforts and conveniences to support residents’ physical, social, spiritual, emotional, and intellectual needs. Built on 8.7 acres, the community’s two meticulously designed buildings will encompass approximately 140,000 square feet of living and communal space. Exceptional, resort-style amenities will include 24/7 gourmet dining, friendly and helpful concierge service, weekly housekeeping, on-call apartment maintenance with all utilities included in an affordable monthly rent. Residents will also enjoy a wellness/fitness center, library/game room, computer room, chapel, formal and casual dining rooms, large lounge and bar, arts studio, reserved parking, theater, and beauty salon/barber shop – all conveniently located on-site. The spectacular grounds will feature numerous amenities, too, which will keep residents active and content such as a Pickleball court, Bocce Ball court, putting green, walking paths, outdoor grill area with state-of-the-art appliances, relaxing fire pit, gazebo, dog park, beautiful courtyards and gardens, and much more. Sunshine Retirement Living, in partnership with Buildable Sites Development, LLC and New Hampshire-based JSA Architects Interior Planners, has taken great care to ensure that the community’s design complements the area’s rich historical heritage. “It was very important to all of us that The Woods at Merrimack become an integral part of the local community and that starts with embracing the spectacular history of the region,” said Serrano. In fact, the property will preserve and maintain the Locke Mansion, built in 1913 and situated near the community’s entrance, while also incorporating its Colonial Revival design elements into the exterior of the new buildings. The community’s design has also been inspired by another period architectural style, the Shingle Style, noted for its informality, asymmetry and eclecticism, which allows for more freedom of design across exterior elements. Other notable design details include a natural stone base, multiple porches, large windows, asymmetrical gables, and a tower element blended into the main volume of the roofline. The lower floors are clad with horizontal lap siding, similar to the Locke House, with shingles used in the upper gables. For more information about The Woods at Merrimack, and the groundbreaking event on Wednesday, September 12, please contact Sarah Peters at (541) 323-5280 or sarah.peters@sunshineret.com.